Republican Georgia State Senator and candidate for Governor Michael Williams appeared cozy with a right-wing paramilitary group while attending ACT For America’s anti-Muslim rally in Atlanta, Georgia Saturday. The Georgia-based III% Security Force stated it was asked by the local ACT chapter to provide security for the event. 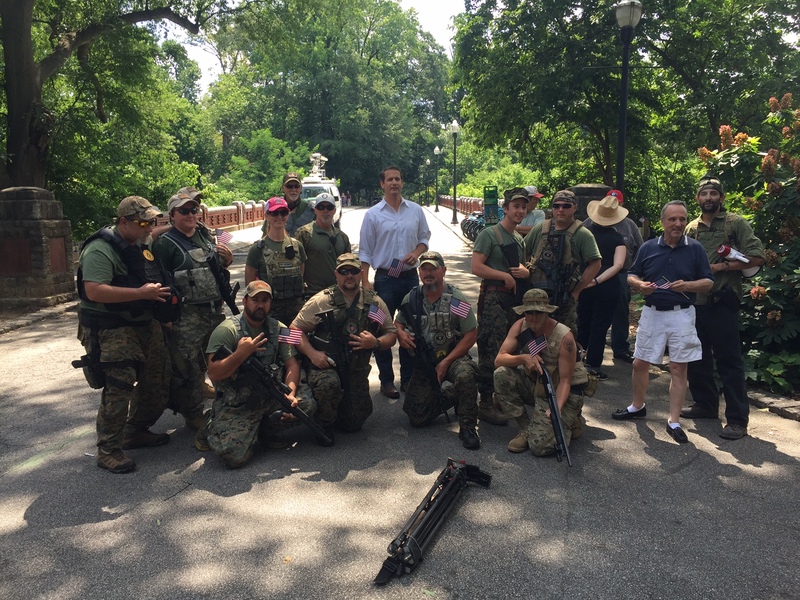 After addressing the rally and calling on attendees to “unite against Sharia law” Williams posed for photographs with the III% Security Force as some of its members flashed a hand symbol that was later attributed to the white nationalist Alt-Right. The gesture in question is the “OK” hand signal — three extended fingers with the thumb and index finger touching to form a circle — that is often seen among the Alt-Right’s followers. The ‘OK’ hoax was actually just the most recent in a recent series of hoaxes in which 4channers (and members of other similar places on the Internet such as 8chan and Reddit) have tried to take innocuous items, symbols or gestures and falsely attribute white supremacist meanings to them in order to fool liberals and get them to spread false messages. Regardless, this is likely not the version of the hand signal that the III% Security Force was displaying last Saturday. For the antigovernment Three Percenter movement this same hand gesture symbolizes their belief in the disputed claim that only three percent of American colonists fought against the British in the American Revolution. The three extended fingers represent this three percent. It is this Threeper version of the “OK” hand symbol — which predates the 4chan troll campaign — that the III% Security Force was most likely flashing last weekend. This clarification is not to excuse the group of its ethnic animus. The Georgia state chapter is listed by the SPLC as an anti-Muslim hate group, though it also espouses antigovernment rhetoric. Chris “General Blood Agent” Hill, the leader of the III% Security Force and its Georgia state chapter, is a well-known anti-Muslim doomsayer that surrenders Islam, and its nearly 2 billion adherents, to the radical views of ISIL and al Qaeda — even though ordinary Muslims have been the most frequent targets of these terrorist organizations. The American far-right is adding to the list of those who target Muslims, and an injection of anti-Muslim thought into the “Patriot” community is trending violently upward. Just last year, three men calling themselves the “Crusaders” were arrested by the FBI for plotting to commit mass murder of Muslims and Somalis in Garden City, Kansas. According to an FBI criminal complaint, the “Crusaders” were synonymous with an antigovernment group called the Kansas Security Force, which shares the naming convention of Hill’s organization. Following the arrests, Hill told Hatewatch that his militia is “associated” with one Kansas Security Force group, but that there are multiple. Hill stated that the group he is associated with is run by Ronald Greek, but claimed to only talk with Greek once a year and said he didn’t know any of the three men arrested in Kansas last year. Greek was a member of a closed Facebook group named “III% Security Force of Kansas.” Another member of the group at the time was Patrick Stein, one of the three men arrested for the murderous plot. The Facebook group has since been taken down. No, Williams likely did not pose for photographs with a group flashing overt white supremacist hand signals. He did, however, stand with a well-known right-wing paramilitary group as they flashed the hand signal of a movement that espouses violent antigovernment rhetoric and anti-Muslim conspiracies.